At age seventeen, Gia Carangi was working the counter at her father's Philadelphia luncheonette, Hoagie City. Within a year, Gia was one of the top models of the late 1970's, gracing the covers of Cosmopolitan and Vogue, partying at New York's Studio 54 and the Mudd Club, and redefining the industry's standard of beauty. She was the darling of moguls and movie stars, royalty and rockers. Gia was also a girl in pain, desperate for her mother's approvaland a drug addict on a tragic slide toward oblivion, who started going directly from $10,000-a-day fashion shoots to the heroin shooting galleries on New York's Lower East Side. Finally blackballed from modeling, Gia entered a vastly different world on the streets of New york and Atlantic City, and later in a rehab clinic. At twenty-six, she became on of the first women in America to die of AIDS, a hospital welfare case visited only by rehab friends and what remained of her family. Drawing on hundreds of interviews with Gia's gamily, lovers, friends, and colleagues, Thing of Beauty creates a poignant portrait of an unforgettable characterand a powerful narrative about beauty and sexuality, fame and objectification, mothers and daughters, love and death. Stephen Fried is an award-winning investigative journalist. His work has also appeared in Vanity Fair, GQ, and the Washington Post Magazine. A winner of a 1993 National Magazine Award, the Distinguished Service Award for Magazine Reporting from the Society of Professional Journalists, and the Clarion Award from Women in Communications, he lives in Philadelphia with his wife Diane Ayres, a fiction writer. Boston Globe Stephen Fried has done an admirable job reconstructing Gia's frenzied life...Fried makes a convincing case, through recording Gia's travails, that fetching eyes and a killer body are not enough. This is a chilling tale that every pretty, stupid young thing should read. Liz Smith Gia's story has everyingglamor, glitz, squalor and tradgedy. 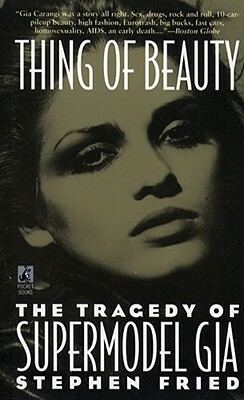 The New York Times Book Review Vivid...The story of Gia Carangi...should be set out among the fashion magazines in modeling agency waiting rooms and any other place where teen-age girls who've been called pretty a little too often hang out...Stephen Fried's exhaustive account of Gia's brief life seems to have an important unanswered quesition on every page: why didn't anyone help Gia?